Ever find yourself craving something sweet? How about something that satiates the sweet tooth without making you feel like crap after? This coveted recipe is naturally sweet, gluten free and actually not bad for you...at all! If you're still with me, I have the perfect treat for you. The dates lend all the sweetness in this gluten free (and guilt-free) recipe - there's no sugar added! From the crumbly oat topping to the gooey, sweet filling, these bars are sure to be a hit with friends and family. What makes this recipe special is our Vanilla Bean Olive Oil - which gives the bars a toasty, nutty flavor. It's my absolute favorite. 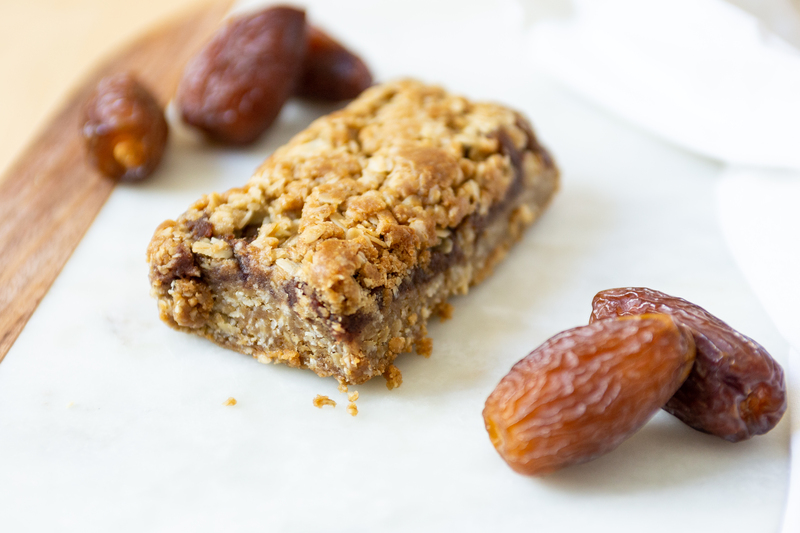 You can view our Gluten Free Date Bar recipe on our website here or scroll on down for the full recipe. Have you tried baking with olive oil before? View all of our 'Sweet' Recipes Here! 2. Add 1 cup oatmeal to a food processor bowl, and process until a flour forms. Add coconut, dates, sea salt and baking soda, and process until the dates are fully broken up. 3. Add the other 1/2 cup oatmeal and walnuts, and pulse 8-10 times, until the walnuts are chopped, but still a bit chunky. 4. To the food processor bowl, add the egg, flax and olive oil, and pulse until combined. Reserve 1/2 cup of oatmeal mixture to use as a topping. 5. Line an 8 x 8 pan with baking paper. Add the rest of the oatmeal cookie mixture to the pan, and press down into an even layer. 7. Carefully, using wet hands to press it down and smooth it, add the date later on top of the cookie layer. Using wet hands will keep the layer from sticking and pulling up the cookie layer. Crumble the reserved 1/2 cup of oatmeal mixture over the top. Will you give these date bars a try?